Dunn, C. and Creamer, C. 2013. Summary of the CDC’s 2013 State Indicator Report on Fruits and Vegetables and projects across the state that are working to increase North Carolinian’s intake of fresh fruits and vegetables. 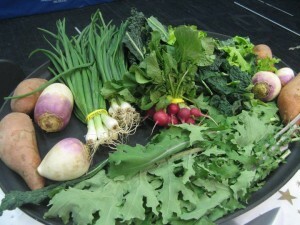 Cooking Local Foods – Research shows that individuals and families who eat more foods at home consume a healthier diet. In order for families to eat more foods at home and connect nutrition to healthy, local foods, cooking skills are an essential teaching strategy to help families adopt new healthy behaviors. 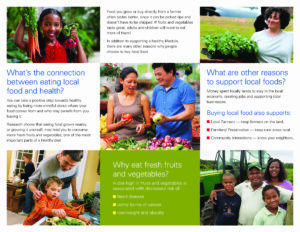 Farmers’ Market_Recipe Cards – These recipes are a part of the Farmers’ Market Tours_Guide designed for nutrition educators to integrate a tour of a farmers’ market into Faithful Families, Steps to Health and EFNEP classes. Educators are provided with tips about how to work with farmers’ markets and Extension agents to provide education about local food and farming, how to use federal nutrition assistance benefits at the market, and how to prepare local food. NC Steps to Health: Harvest of the Month handouts – NC Harvest of the Month handouts highlight one fruit or vegetable and include nutrition, physical activity, recipes, and fun facts related to North Carolina. Provide access to affordable healthy food. Implement policies and practices to improve the availability of locally grown foods by expanding farmers markets and farm stands (schools, communities, etc). Implement policies to offer and promote healthier foods and beverages as part of an overall marketing mix, especially to children. Provide mechanisms for purchasing locally grown foods. Project of HPDP and Warren County Regional Food Center. Establishes new farm-to-fork connections between local growers and low-income consumers in Warren County NC. 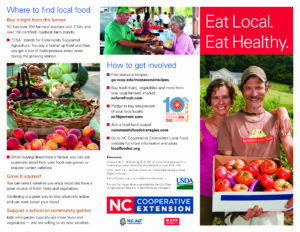 Tri-fold brochure developed by North Carolina Cooperative Extension. Please print professionally. The brochure design does not print well on home/office printers. State Indicator Report on Fruits and Vegetables, 2018Highlights approaches to increase the purchase, supply, and demand of fruits and vegetables in states and communities across the United States. The report shows the status of 10 indicators of fruit and vegetable access and production for all 50 states and the District of Columbia. The report also highlights state successes and provides strategies for improvement. North Carolina Action Guide on Fruits and Vegetables, 2018 This guide provides actionable steps that public health practitioners, decision makers, and agriculture and food systems leaders can take to promote a healthy food environment and support fruit and vegetable consumption in North Carolina. Includes information on promoting food policy councils, starting farmers’ markets and community-supported-agriculture, supporting community and home gardens and more. Learn and accelerate best practices to promote healthy food access and healthier food systems. N.C. Fresh Produce Safety Portal provides information to consumers concerning foodborne illnesses and educational resources. North Carolina Cooperative Extension Family and Consumer Sciences resources including food safety for consumers as well as resources on equipment, specific foods, and Extension agent resources.